Zamani, Mahdi, Akbari, Hassan, Hadavi, Faramarz. (1395). Best Orientation Determination of Buildings in Zanjan City Based on Solar Radiation. معماری و شهرسازی آرمان شهر, 9(16), 85-94. Mahdi Zamani; Hassan Akbari; Faramarz Hadavi. "Best Orientation Determination of Buildings in Zanjan City Based on Solar Radiation". معماری و شهرسازی آرمان شهر, 9, 16, 1395, 85-94. Zamani, Mahdi, Akbari, Hassan, Hadavi, Faramarz. (1395). 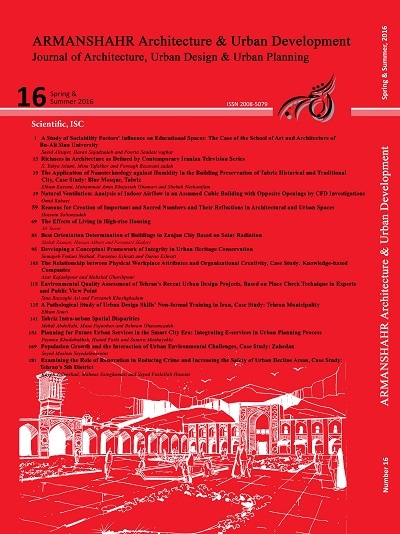 'Best Orientation Determination of Buildings in Zanjan City Based on Solar Radiation', معماری و شهرسازی آرمان شهر, 9(16), pp. 85-94. Zamani, Mahdi, Akbari, Hassan, Hadavi, Faramarz. Best Orientation Determination of Buildings in Zanjan City Based on Solar Radiation. معماری و شهرسازی آرمان شهر, 1395; 9(16): 85-94. 1Ph.D. in Geomorphology, Islamic Azad University of Tehran, Science and Research Branch, Tehran, Iran. 2Assistant Professor of Architecture, Faculty of Technical and Engineering, University of Mohaghegh Ardabili, Architecture Department, Ardabil, Iran. 3Ph.D. Student of Geography and Urban Planning, Department of Geography, Payame Noor University, Tehran, Iran. In recent years, high consumption of energy has become one of the major problems of world, especially in big cities. One of the solutions given for this situation is using solar energy as much as possible. If buildings are constructed in accordance with solar radiation and regional climate, they can absorb the lowest energy in hot and the most energy in cold periods; there will then be noticeable saving in energy consumption. Since Zanjan has special location, the buildings’ orientation should be in a way that the most possible energy could be absorbed by the building through the cold periods, and the lowest amount of energy would be able to hit the building in hot periods. In this research, to reach the most efficient use of solar energy in Zanjan, as the case study of research, first the climate information of 40 years timing was collected from Zanjan Synoptic Center, and the orientation and height of sun was extracted afterwards by using Q-BASIC software. The amount of solar radiation on vertical surfaces of walls in various angles was calculated using law of cosines. And finally the best orientation for buildings in this city has been determined. The results of this research showed that vertical surfaces with the orientations of +150 and -150 south-west absorb the most amount of energy, and the surfaces with orientations of +15 and -15 north-east and west absorb the lowest energy in cold and hot months of the year. The highest difference of radiated energy in vertical surfaces is at +135 south - east and – 135 southwest through hot and cold periods. According to the research results, the best settlement orientations for buildings are 135 degree and 225 degree of Azimuth angle. Adl, A .H. (1960). Iran’s Climate and Plants Divisions, Tehran University Publications. Of Weather In Housing Design), Geographical Research Journal, (35). Azizi, Gh. (2004). Climate Change, Ghomes Publishers. Domestic Energy Consumption, HONAR-HA-YE-ZIBA,18 (1), spring. of Architectural Engineering & Urban Planning, 22 (2). Role in Housing Design, Journal of New Approaches inHuman Geography, 4(2), spring. Hossein Abadi, S., Lashkari, H., & Salmani Moghadam, M. (2012). Climate Design of Buildings in Sabzevar with an Emphasis on Orientation and Shelter Depth, Geography and Development, (27), summer. Kasmaee, M. (1993). Iran’s Climatic Divisions- Housing and Residential Environment, Tehran: Building and Housing Research Center Publications. Kasmaee, M. (2005). Climate and Architecture, Iran House Making Company Publications. Kaviani, M. (1993). Investigating Iran’s Human Climate, Geographical Research Journal, (28). Lashkari, H., Mouzemi, S., Salki, H., & Lotfi, K. (2011). Optimizing Buildings Orientation in Ahvaz Based on Climate, Natural Geography, 4 (12), summer. Schools Architectural Pattern, Master Dissertation, Shahid Beheshti University. Master dissertation, Shahid Beheshti University. Razjouyan, M. (1988). Comfort by Climate FriendlyArchitecture, Tehran: Shahid Beheshti University Publications. Razjouyan, M. (2000). Comfort in Wind, Shahid Beheshti University Publications. Lima Peru.Tavasoli, M. (1981). Constructing Cities and Buildings in Iran’s Warm and Dry Climate, Fine Arts Faculty, Tehran University.